This utility is part of the bigfug Video Streaming System that enables real-time transfer of video between different applications on one or more networked computers. 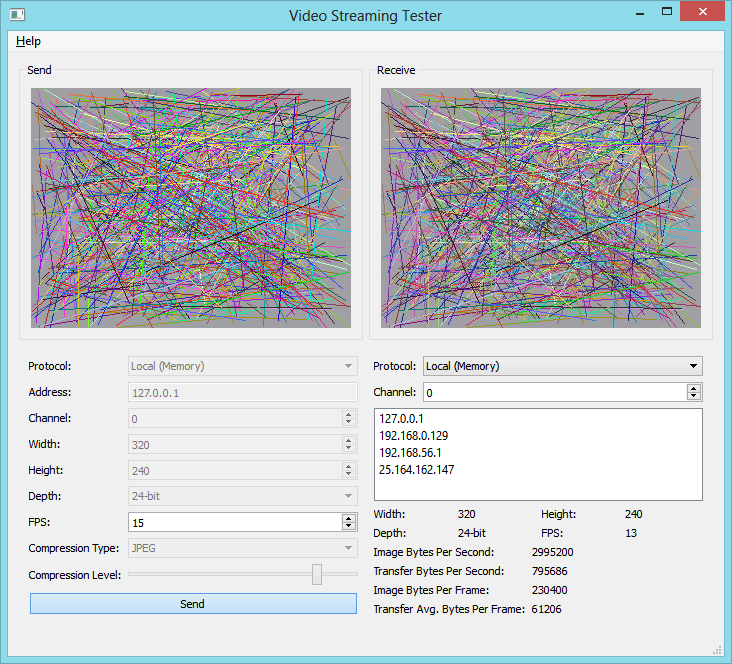 fugVidStreamTool is a free and useful utility for trying out different video streaming configurations. You can use it to test your network and processing performance. Local (Memory) is the fastest protocol but only works between applications on the same computer. Remote (TCP) is the main protocol for transferring to another application on a different computer. Multicast (UDP) sends the same data to multiple computers on a network. Each protocol has a large number of channels. To successfully send data to a receiver, both need to be set to the same protocol and channel number. The receiver is always running. You can change the Protocol and Channel. The receiver lists all the local IP network addresses of the computer it is running on. The receiver shows information about the stream it is receiving. The sender address is only used for the “Remote (TCP)” protocol. It should be set to the IP address of the destination receiver. FPS (Frames Per Second) sets how many frames of video to send out per second. Compression Type is either NONE or JPEG. It is recommended to use NONE when using the “Local (Memory)” protocol, and JPEG when sending data across a network. Compression Level sets the amount of compression used. If the slider is set to the left, the image will be compressed as much as possible but it will make the image look quite corrupted. If the slider is set to the right, the image will be good quality but the byte size per frame will be larger. You should aim to set the slider as low as possible while keeping an acceptable image quality.